I am a big fan of this distributor and their strange and wonderful films they get to release straight to DVD. Now they have just sent what wonders await you in the next couple of months. Up until this year, the most legendary of all the martial arts heroes CHEN ZHEN – a Eastern fictional martial arts master recurring in Eastern culture – had only been played by two actors on the big screen. Bruce Lee in the seminal ‘Fist Of Fury’ and Jet Li in the breakout hit ‘Fist Of Legend’. This year, the baton will be passed to a new martial arts superstar. 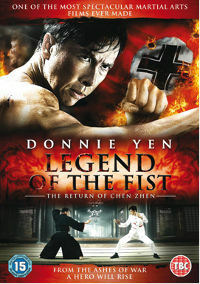 A new martial arts master who has already proved his worth in the East, starring in numerous movies and invented the highly revered Triple Kick in his high-octane, jaw-dropping style, Donnie Yen. In Shanghai during World War II: Several years after the death of the legendary masked crime-fighter CHEN ZHEN, a mysterious and charming stranger works his way to the upper-echelons of the Shanghai mafia. But, by night, a caped martial arts genius begins single-handedly taking out the city’s underworld figures. Prepare yourself for some of the most incredible action sequences ever committed to celluloid.. The wartime action-adventure is given a thrilling sci-fi twist in the time-bending PARADOX SOLDIERS, which fuses spectacular World War II action with the classic time travel enigma: what if you went back in time and accidentally did something that would critically affect your future existence? Four strangers are enjoying a World War II re-enactment weekend when fantasy becomes reality and they find themselves accidentally caught up in a time vortex which throws them back to the real Second World War. Desperate to avoid capture by Nazi forces, the four must put aside their differences to find another portal that will return them to their own time. On the way, they accidentally become embroiled in one of history’s most notorious, bloody and pivotal battles and realise if they fail in their mission, their future selves will never exist. 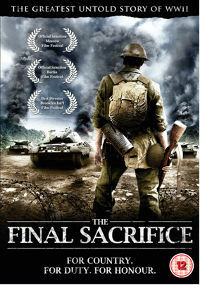 One of the great untold World War II stories, THE FINAL SACRIFICE is a thrilling and powerful portrait of those heroic souls willing to give their lives for country, for family, for honour. Set in Northern Italy during the last embers of the Second World War, the beleaguered vanguard of Axis forces, entrenched on an increasingly isolated position, suffer daily aerial bombings and the constant threat of attack from local partisans. Tempers flare between these ‘allies’, as their enemies threaten to overwhelm them and their impending fate looms over the devastated, war-torn horizon. Compellingly directed, this explosive, action-packed war film combines the disparate stories revealed in the long lost letters of a desperate band of brothers fighting on the front line. 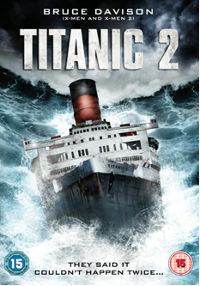 After a deep, dark rumble is heard in the distance, a huge tidal wave approaches the ship and smashes into its side, rending a vicious hole and putting tremendous pressure on the turbines. As the engines finally give out and the liner comes to a halt, the celebratory voyage becomes a nightmare as passengers battle to reach the lifeboats.